Many places in the world have an alcoholic drink which embodies the spirit and people in such a way that it has become known worldwide as a symbol of the destination. The drink can be as important a part of the local culture as music and arts and is a essential experience for any visiting tourist. The following six drinks are great experiences to be had while abroad, but recipes have been provided for those wishing to 'Travel in their own home'. The Singapore Sling is a sweet blend of flavours that combines British gin with Southeast Asian Sarawak pineapple juice. The Singapore Sling is a cocktail that was developed sometime before 1915 by a bartender working at the Long Bar in Raffles Hotel Singapore. 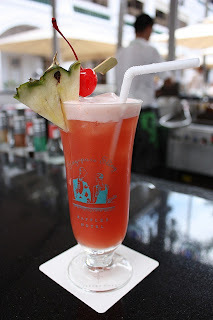 The original recipe is said to have used gin, Cherry Heering, Bénédictine, and fresh pineapple juice, primarily from Sarawak pineapples which enhance the flavour and create a foamy top; however, the original recipe was lost sometime in the 1930's, presumably following a Singapore Sling binge. The current Raffles Hotel recipe is a heavily modified version of the original, most likely changed sometime in the 1970s. Today, many of the "Singapore Slings" served at Raffles Hotel have been pre-mixed and are dispensed using an automatic dispenser that combines both alcohol and pineapple juice to pre-set volumes. They are then blended instead of shaken to create a nice foamy top as well as to save time because of the large number of orders. However, it is still possible to request a shaken version from bartenders. The Mojito is, simply put, Cuba's drink. It is a drink that is vibrant, refreshing, intoxicating and at its best, highly enjoyable. Traditionally made of five ingredients: white rum, sugar (sugar cane juice), lime juice, sparkling water and mint, the original Cuban recipe uses spearmint or yerba buena, a mint variety very popular in the island. Its combination of sweetness, refreshing citrus and mint flavors are intended to complement the potent kick of the rum, and have made this clear highball a popular summer drink. Cuba is the birthplace of the Mojito, although the exact origin of this classic cocktail is highly debated. One story traces the Mojito to a similar 16th century drink, the "El Draque", in honor of Sir Francis Drake which was made initially with tafia/aguardiente, a primitive predecessor of rum. Mint, lime and sugar were helpful in hiding the harsh taste of this spirit. While this drink was not called a Mojito at this time, it was still the original combination of these ingredients. There are several theories behind the origin of the name Mojito; one such theory holds that name relates to mojo, a Cuban seasoning made from lime and used to flavour dishes. Another theory is that the name Mojito is simply a derivative of mojadito, Spanish for "a little wet", or simply the diminutive of "mojado" (wet). While is cannot be known with any certainty how the drink came to be it is known that it has remained a favourite of locals and travellers alike for over 300 years. One of recent history's most famous intoxicated travellers, Earnest Hemingway is known to have been a big fan of the mojito and drank them at La Bodeguita del Medio in Havana. Mint sprigs muddled with sugar and lime juice. Rum added and topped with soda water. Garnished with sprig of mint leaves. Served with a straw. Clam broth, tomato juice and vodka....doesn't that sound appetizing? A Caesar is a cocktail created and primarily consumed in Canada. 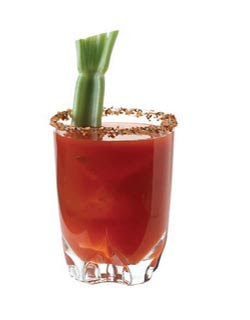 It contains vodka, Clamato (a proprietary blend of tomato juice and clam broth), Worcestershire sauce and Tabasco sauce, and is served on the rocks in a large, celery salt-rimmed glass, typically garnished with a stalk of celery. The culinary genius that invented this masterpiece is bartender Walter Chell of the Owl's Nest Bar in the Calgary Inn in Calgary, Alberta in 1969. In its original form, it contained tomato juice and mashed clams; Clamato had only just been released (with the assistance of Chell) by the Mott's company that very year, and was not yet widely known or available. 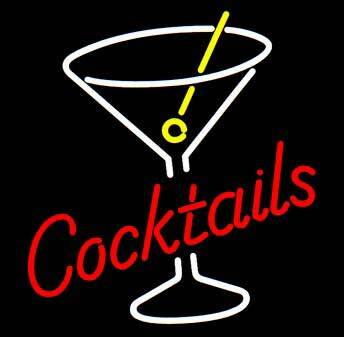 Since 1969 the drink has spread across Canada like wildfire and today is popular coast-to-coast. A must-try on any visit to the great white north because few bars outside of Canada keep Clamato on stock. Rim glass first with Lime wedge and then with celery salt. 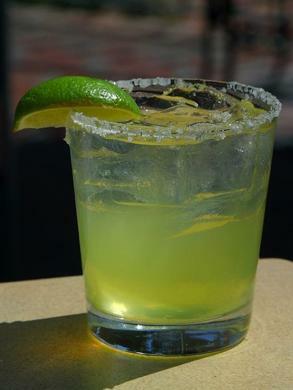 Fill the glass with ice and add the tequila and lime juice. A drink that is synonymous with Southeast Asian travel, the Thai bucket, is a nearly unavoidable when partying on on of Thailand's many beautiful beaches. The most commonly had buckets contain a small bottle of Red-Bull, a bottle of Mehkong or Samsong (Thai whiskey) and cola. 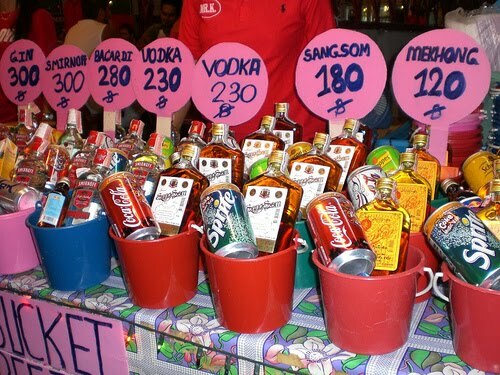 Buckets are as essential to a Thai beach party as fire dancers and electronic music. Make sure that Thai Buckets are on you Bucket list. One drink that travellers should not leave Vietnam without trying is the nightmarish blend of snake blood and throat-incinerating booze. Is your mouth watering yet? Snake blood wine is prepared by slicing a snake along its belly and draining its blood directly into the shot glass filled with rice wine or grain alcohol. Snake bile wine is follows a similar method by using the contents of the gall bladder. Snakes are believed to possess medicinal qualities in many Southeast Asian countries and the wine is often advertised to cure everything from farsightedness to hair loss, as well as to increase sexual performance. Braver drinkers may eat certain parts of the snake or snakes such as the gall bladder, the eyeballs or the still beating heart. Delicious. On second thought...you probably shouldn't make this at home. 5 Reasons to Get up and Go!